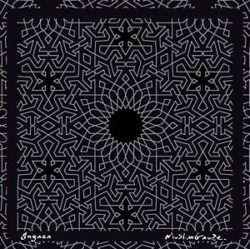 Staalplaat presents a double LP reissue of Muslimgauze’s Ingaza, originally released in 1999 (the year of his death) as part of the Box Of Silk And Dogs set. Those not familiar with Bryn Jones’s style will listen slack-jawed at the sheer anticipatory nature of his sound collages. He was a cult artist, politically motivated for the Arab-Palestinian cause and a seminal experimenter with ethnic samples’ and minimal and electronic rhythms. The atmospheres retain their original charm, full and gloomy, but pulsating with provocative emotions, different from the exotic and ornamental processing of certain world music. Drum machines, old synths, and percussion are all combined in a traditional way, without any computer assistance. “Peace is a distant dream,” said Bryn Jones, in one of his last interviews before passing away from a rare blood disease, and on both sizes things seem to unfortunately still be the same. Ingaza is thematically and stylistically all over the place, sporting atmospheric instrumental loops one moment and jarring, heavily barbed and distorted beats the next. Differences between tracks, not unlike changing channels on television or switching between net browsers, predominate, with imagery conjuring Middle Eastern travel and tourism on one screen whilst grisly proxy war footage plays on the next.